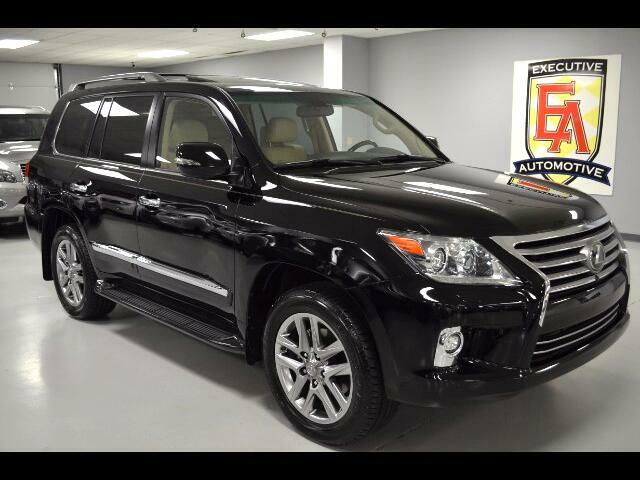 2014 Lexus LX 570, Black with Tan Leather, 13k Miles. Options Include: NAVIGATION SYSTEM, REAR SEAT ENTERTAINMENT SYSTEM, BACK-UP CAMERA, ADAPTIVE CRUISE CONTROL, BRAKE ASSIST SYSTEM, COOLED AND HEATED FRONT SEATS, HEATED REAR SEATS, HEATED STEERING WHEEL, PREMIUM STEREO, STEERING WHEEL AUDIO CONTROLS, DUAL ZONE A/C, TRAILER HITCH RECEIVER, ILLUMINATED RUNNING BOARDS, PUSH BUTTON START, KEY-LESS ENTRY, 7 PASSENGER SEATING, 3RD ROW SEAT, CD CHANGER, AUTO LEVELING HEADLIGHTS, HID HEADLIGHTS, 20" ALLOYS, POWER TILT/SLIDING SUNROOF, BLUETOOTH CONNECTION, AUXILIARY AUDIO INPUT, SMART DEVICE INTEGRATION, HD RADIO, FOG LIGHTS, DRIVER/PASSENGER ADJUSTABLE LUMBAR, ELECTROCHROMIC REAR-VIEW MIRROR, UNIVERSAL GARAGE DOOR OPENER, TURN SIGNAL MIRRORS, REAR SPOILER, REAR A/C, RAIN SENSING WIPERS, POWER WINDOWS, POWER LOCKS, POWER MIRRORS, POWER FOLDING MIRRORS, POWER LIFT-GATE, POWER SEATS (both) and more! Contact Kyle Porter at 816-616-2500 or email: kyle@executiveautomotive.com for additional information. Thanks for your interest in our LX 570!